Will China’s growth continue forever? Annual GDP growth in the US is currently 2.1%, while annual GDP growth in China is 6.9%. At markte exchange rates, US GDP is currently $18.6 trillion, while China’s GDP is $11.2 trillion. If these growth rates continue, that means that China’s GDP will surpass ours in just 12 years. Looking instead at per-capita GDP (and now using purchasing-power-parity, which is a much better measure for standard of living), the US is currently at $53,200 per person per year while China is at $14,400 per person per year. Since 2010 US per-capita GDP PPP has been growing at about 1.2%, while China’s has been growing at 7.1%. At that rate, China will surpass the US in standard of living in only 24 years. And then if you really want to get scared, you start thinking about what happens if this growth continues for 20, or 30, or 50 years. At 50 years of these growth rates, US GDP will just about triple; but China’s GDP would increase by almost a factor of thirty. US per-capita GDP will increase to about $150,000, while China’s per-capita GDP will increase all the way to $444,000. But while China probably will surpass the US in total nominal GDP within say 15 years, the longer-horizon predictions are totally unfounded. In fact, there is reason to believe that China will never surpass the US in standard of living, at least within the foreseeable future. Sure, some sort of global catastrophe could realign the world’s fortunes (climate change being a plausible candidate) and over very long time horizons all sorts of things can happen; but barring catastrophe and looking within the next few generations, there’s little reason to think that the average person in China will actually be better off than the average person in the United States. Indeed, while that $150,000 figure is actually remarkably plausible, that $444,000 figure is totally nonsensical. I project that in 2065, per-capita GDP in the US will indeed be about $150,000, but per-capita GDP in China will be more like $100,000. That’s still a dramatic improvement over today for both countries, and something worth celebrating; but the panic that the US must be doing something wrong and China must be doing something right, that China is “eating our lunch” in Trump’s terminology, is simply unfounded. Why am I so confident of this? Because, for all the proud proclamations of Chinese officials and panicked reports of American pundits, China’s rapid growth rates are not unprecedented. We have seen this before. Look at South Korea. As I like to say, the discipline of development economics is basically the attempt to determine what happened in South Korea 1950-2000 and how to make it happen everywhere. In 1960, South Korea’s nominal per-capita GDP was only $944. In 2016, it was $25,500. That takes them from solidly Third World underdeveloped status into very nearly First World highly-developed status in just two generations. This was an average rate of growth of 6.0%. But South Korea didn’t grow steadily at 6.0% for that entire period. Their growth fluctuated wildly (small countries tend to do that; they are effectively undiversified assets), but also overall trended downward. The highest annual growth rate in South Korea over that time period was an astonishing 20.8%. Over twenty percent per year. Now that is growth you would feel. Imagine going from an income of $10,000 to an income of $12,000, in just one year. Imagine your entire country doing this. In its best years, South Korea was achieving annual growth rates in income comparable to the astronomical investment returns of none other than Warren Buffett (For once, we definitely had r < g). Even if you smooth out over the boom-and-bust volatility South Korea went through during that period, they were still averaging growth rates over 7.5% in the 1970s. I wasn’t alive then, but I wouldn’t be surprised if Americans back then were panicking about South Korea’s growth too. Maybe not, since South Korea was and remains a close US ally, and their success displayed the superiority of capitalism over Communism (boy did it ever: North Korea’s per capita GDP also started at about $900 in 1960, and is still today… only about $1000! ); but you could have made the same pie-in-the-sky forecasts of Korea taking over the world if you’d extrapolated their growth rates forward. South Korea’s current growth rate, on the other hand? 2.9%. Not so shocking now! Moreover, this is a process we understand theoretically as well as empirically. The Solow model is now well-established as the mainstream neoclassical model of economic growth, and it directly and explicitly predicts this sort of growth pattern, where a country that starts very poor will initially grow extremely fast as they build a capital base and reverse-engineer technology from more advanced countries, but then over a couple of generations their growth will slow down and eventually level off once they reach a high level of economic development. I think I can best instill this realization in you by making another comparison between the US and China: How much income are we adding in absolute terms? US per-capita GDP of $53,200 is growing at 1.2% per year; that means we’re adding $640 per person per year. China per-capita GDP of $14,400 is growing at 7.1% per year; that means they’re adding $1,020 per year. So while it sounds like they are growing almost six times faster, they’re actually only adding about 40% more real income per person each year than we are. It’s just a larger proportion to them. Indeed, China is actually doing relatively well on this scale. Many developing countries that are growing “fast” are actually adding less income per person in absolute terms than many highly-developed countries. India’s per capita GDP is growing at 5.8% per year, but adding only $340 per person per year. Ethiopia’s income per person is growing by 4.9%—which is only $75 per person per year. Compare this to the “slow” growth of the UK, where 1.0% annual growth is still $392 per person per year, or France, where “stagnant” growth of 0.8% is still $293 per person per year. Back when South Korea was growing at 20%, that was still on the order of $200 per person per year. Their current 2.9%, on the other hand, is actually $740 per person per year. We often forget just how poor many poor countries truly are; what sounds like a spectacular growth rate still may not be all that much in absolute terms. 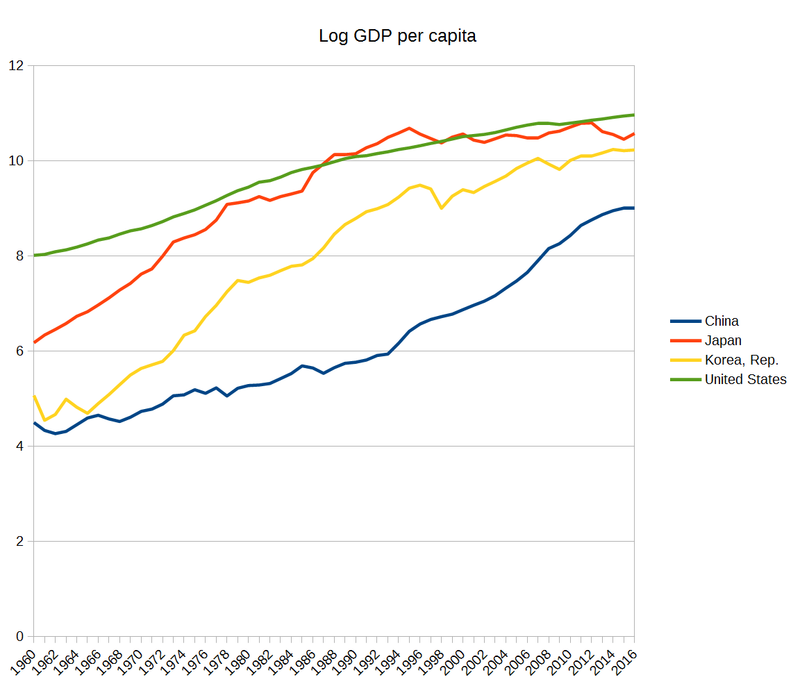 Here’s a graph (on a log scale) of GDP per capita in the US, Japan, China, and Korea, from World Bank data since 1960. I’d prefer to use GDP PPP, but the World Bank data doesn’t go back far enough. As you can see, there is a general pattern of growth at a decreasing rate; it’s harder to see in China because they are earlier in the process; but there’s good reason to think that they will follow the same pattern. If anything, I think the panic about Japan in the 1990s may have been more justifiable (not that it was terribly justified either). As you can see on the graph, in terms of nominal GDP per capita, Japan actually did briefly surpass the United States in the 1990s. Of course, the outcome of that was not a global war or Japan ruling the world or something; it was… the Nintendo Wii and the Toyota Prius. Of course, that doesn’t stop people from writing news articles and even publishing economic papers about how this time is different, not like all the other times we saw the exact same pattern. Many Chinese officials appear to believe that China is special, that they can continue to grow at extremely high rates indefinitely without the constraints that other countries would face. But for once economic theory and economic data are actually in very good agreement: These high growth rates will not last forever. They will slow down, and that’s not such a bad thing. By the time they do, China will have greatly raised their standard of living to something very close to our own. Hundreds of millions of people have already been lifted out of abject poverty; continued growth could benefit hundreds of millions more. The far bigger problem would be if the government refuses to accept that growth must slow down, and begins trying to force impossible levels of growth or altering the economic data to make it appear as though growth has occurred that hasn’t. We already know that the People’s Republic of China has a track record of doing this sort of thing: we know they have manipulated some data, though we think only in small ways, and the worst example of an attempt at forcing economic growth in human history was in China, the so-called “Great Leap Forward” that killed 20 million people. The danger is not that China will grow this fast forever, nor that they will slow down soon enough, but that they will slow down and their government will refuse to admit it. A few weeks ago I tried to provide assurances that the “student debt crisis” is really not much of a crisis; there is a lot of debt, but it is being spent on a very good investment both for individuals and for society. Student debt is not that large in the scheme of things, and it more than pays for itself in the long run. But this does not mean we are not in the midst of an education crisis. It’s simply not about debt. The crisis I’m worried about involves access. As you may recall, there are a substantial number of people with very small amounts of student debt, and they tend to be the most likely to default. The highest default rates are among the group of people with student debt greater than $0 but less than $5000. So how is it that there are people with only $5,000 in student debt anyway? You can’t buy much college for $5,000 these days, as tuition prices have risen at an enormous rate: From 1983 to 2013, in inflation-adjusted dollars, average annual tuition rose from $7,286 at public institutions and $17,333 at private institutions to $15,640 at public institutions and $35,987 at private institutions—more than doubling in each case. Enrollments are much higher, but this by itself should not raise tuition per student. So where is all the extra money going? Some of it is due to increases in public funding that have failed to keep up with higher enrollments; but a lot of it just seems to be going to higher pay for administrators and athletic coaches. This is definitely a problem; students should not be forced to subsidize the millions of dollars most universities lose on funding athletics—the NCAA, who if anything are surely biased in favor of athletics, found that the total net loss due to athletics spending at FBS universities was $17 million per year. Only a handful of schools actually turn a profit on athletics, all of them Division I. So it might be fair to speak of an “irresponsible college administration crisis”, administrators who heap wealth upon themselves and their beloved athletic programs while students struggle to pay their bills, or even a “college tuition crisis” where tuition keeps rising far beyond what is sustainable. But that’s not the same thing as a “student debt crisis”—just as the mortgage crisis we had in 2008 is distinct from the slow-burning housing price crisis we’ve been in since the 1980s. Making restrictions on mortgages tighter might prevent banks from being as predatory as they have been lately, but it won’t suddenly allow people to better afford houses. And that would have been the wrong decision. So, these students who have $5,000 or less in student debt; what does that mean? That amount couldn’t even pay for a single year at most universities, so how did that happen? Well, they almost certainly went to community college; only a community college could provide you with a nontrivial amount of education for less than $5,000. But community colleges vary tremendously in their quality, and some have truly terrible matriculation rates. While most students who start at a four-year school do eventually get a bachelor’s degree (57% at public schools, 78% at private schools), only 17% of students who start at community college do. And once students drop out, they very rarely actually return to complete a degree. Indeed, the only way to really have that little student debt is to drop out quickly. Most students who drop out do so chiefly for reasons that really aren’t all that surprising: Mostly, they can’t afford to pay their bills. “Unable to balance school and work” is the number 1 reported reason why students drop out of college. In the American system, student loans are only designed to pay the direct expenses of education; they often don’t cover the real costs of housing, food, transportation and healthcare, and even when they do, they basically never cover the opportunity cost of education—the money you could be making if you were working full-time instead of going to college. For many poor students, simply breaking even on their own expenses isn’t good enough; they have families that need to be taken care of, and that means working full-time. Many of them even need to provide for their parents or grandparents who may be poor or disabled. Yet in the US system it is tacitly assumed that your parents will help you—so when you need to help them, what are you supposed to do? You give up on college and you get a job. The most successful reforms for solving this problem have been comprehensive; they involved working to support students directly and intensively in all aspects of their lives, not just the direct financial costs of school itself. Another option would be to do something more like what they do in Sweden, where there is also a lot of student debt, but for a very different reason. The direct cost of college is paid automatically by the government. Yet essentially all Swedish students have student debt, and total student debt in Sweden is much larger than other European countries and comparable to the United States; why? Because Sweden understands that you should also provide for the opportunity cost. In Sweden, students live fully self-sufficient on student loans, just as if they were working full-time. They are not expected to be supported by their parents. The problem with American student loans, then, is not that they are too large—but that they are too small. They don’t provide for what students actually need, and thus don’t allow them to make the large investment in their education that would have paid off in the long run. Panic over student loans being too large could make the problem worse, if it causes us to reduce the amount of loanable funds available for students. The lack of support for poor students isn’t the only problem. There are also huge barriers to education in the US based upon race. While Asian students do as well (if not better) than White students, Black and Latino students have substantially lower levels of educational attainment. Affirmative action programs can reduce these disparities, but they are unpopular and widely regarded as unfair, and not entirely without reason. A better option—indeed one that should be a no-brainer in my opinion—is not to create counter-biases in favor of Black and Latino students (which is what affirmative action is), but to eliminate biases in favor of White students that we know exist. Chief among these are so-called “legacy admissions”, in which elite universities attract wealthy alumni donors by granting their children admission and funding regardless of whether they even remotely deserve it or would contribute anything academically to the university. These “legacy admissions” are frankly un-American. They go against everything our nation supposedly stands for; in fact, they reek of feudalism. And unsurprisingly, they bias heavily in favor of White students—indeed, over 90 percent of legacy admits are White and Protestant. Athletic admissions are also contrary to the stated mission of the university, though their racial biases are more complicated (Black students are highly overrepresented in football and basketball admits, for example) and it is at least not inherently un-American to select students based upon their athletic talent as opposed to their academic talent. But this by itself would not be enough; the gaps are clearly too large to close that way. Getting into college is only the start, and graduation rates are much worse for Black students than White students. Moreover, the education gap begins well before college—high school dropout rates are much higher among Black and Latino studentsas well. In fact, even closing the education gap by itself would not be enough; racial biases permeate our whole society. Black individuals with college degrees are substantially more likely to be unemployed and have substantially lower wages on average than White individuals with college degrees—indeed, a bachelor’s degree gets a Black man a lower mean wage than a White man would get with only an associate’s degree. Fortunately, the barriers against women in college education have largely been conquered. In fact, there are now more women in US undergraduate institutions than men. This is not to say that there are not barriers against women in society at large; women still make about 75% as much income as men on average, and even once you adjust for factors such as education and career choice they still only make about 95% as much. Moreover, these factors we’re controlling for are endogenous. Women don’t choose their careers in a vacuum, they choose them based upon a variety of social and cultural pressures. The fact that 93% of auto mechanics are men and 79% of clerical workers are women might reflect innate differences in preferences—but it could just as well reflect a variety of cultural biases or even outright discrimination. Quite likely, it’s some combination of these. So it is not obvious to me that the “adjusted” wage gap is actually a more accurate reflection of the treatment of women in our society than the “unadjusted” wage gap; the true level of bias is most likely somewhere in between the two figures. Gender wage gaps vary substantially across age groups and between even quite similar countries: Middle-aged women in Germany make 28% less than middle-aged men, while in France that gap is only 19%. Young women in Latvia make 14% less than young men, but in Romania they make 1.1% more. This variation clearly shows that this is not purely the effect of some innate genetic difference in skills or preferences; it must be at least in large part the product of cultural pressures or policy choices. Even within academia, women are less likely to be hired full-time instead of part-time, awarded tenure, or promoted to administrative positions. Moreover, this must be active discrimination in some form, because gaps in hiring and wage offers between men and women persist in randomized controlled experiments. You can literally present the exact same resume and get a different result depending on whether you attached a male name or a female name. But at least when it comes to the particular question of getting bachelor’s degrees, we have achieved something approaching equality across gender, and that is no minor accomplishment. Most countries in the world still have more men than women graduating from college, and in some countries the difference is terrifyingly large. I found from World Bank data that in the Democratic Republic of Congo, only 3% of men go to college—and less than 1% of women do. Even in Germany, 29% of men graduate from college but only 19% of women do. Getting both of these figures over 30% and actually having women higher than men is a substantial achievement for which the United States should be proud. Yet it still remains the case that Americans who are poor, Black, Native American, or Latino are substantially less likely to ever make it through college. Panic about student debt might well be making this problem worse, as someone whose family makes $15,000 per year is bound to hear $50,000 in debt as an overwhelming burden, even as you try to explain that it will eventually pay for itself seven times over. We need to instead be talking about the barriers that are keeping people from attending college, and pressuring them to drop out once they do. Debt is not the problem. Even tuition is not really the problem. Access is the problem. College is an astonishingly good investment—but most people never get the chance to make it. That is what we need to change.